I don’t really know how the name ‘Chinese bread’ was first used when referring to the dish I am introducing today, as it is not really ‘bread’ bread. If you are familiar with Cantonese Dim Sim, there is something similar to Chinese bread called “Bon”. In the North East of China, Chinese steamed bread (without any fillings) is called ‘Man Tou’, but any other similar kind of steamed bread with fillings is called ‘Bao’ (Mandarin word for Bon). 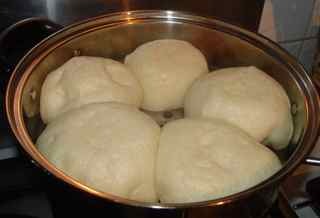 In Northern China, Mantou/Chinese steamed bread is a very common “staple food” that often replaces rice on the dining table. Mantou is thought to be a bit ‘dry’, so it is usually accompanied with soup or congee. 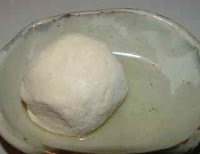 Mantou is not difficult to make — raise the flour, shape it into ‘half a ball’, then steam. 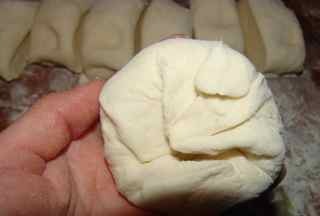 Nowadays, Mantou is normally made with white plain flour, which gives a very soft texture. As I mentioned before, many dishes from the times were China was ‘poor’ have been brought back to the dining table, and become very popular and highly recommended for their ‘healthy properties’. So, for example, making Mantou with wholemeal flour or corn flour is becoming more and more popular. 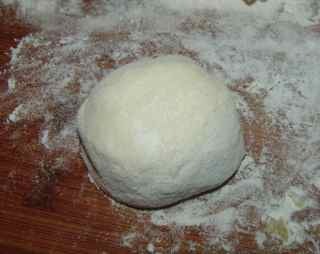 The flour, however, does not raise and become very soft after steamed as with plain flour. 1) Making raising flour. I normally use (same as always) 4 cups of flour, 1 and 1/4 cup of water, around 5g fast yeast. 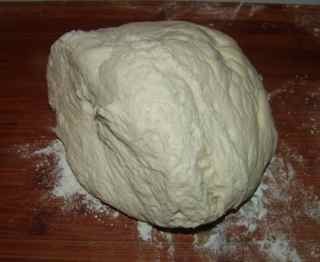 2) After raising the flour, dust the board with dry flour, and place the dough on it. Knead well. 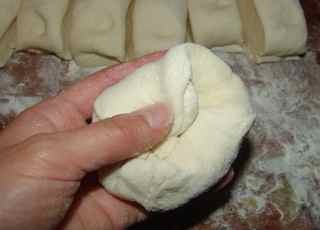 3) Divide the dough into small portions, don’t worry if they look small, need to keep in mind that after steaming, it will raising up again. So don’t make the portion too big. 4) Shaping the Man tou. 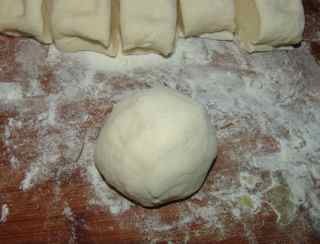 There are two ways of making the small doughs into half ball shape. One is to use both hand ‘rub’ it into the shape from the small portion dough directly, (above pic) but it is a little bit difficult to shape the top ‘round’shape; the second method, which is my parents use, to press the small dough flat, then take the edges and press them into the centre (more like filling inside with its own edges), then ‘throw’ it hard onto the board, and ‘rub’ the side make it into the final shape. 1) Before putting the man tou into the steamer, it is better to ‘dip’ it in oil – this is only for avoiding it getting sticky on the steamer sheet. 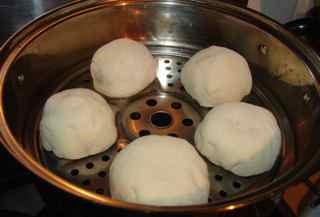 3) Cover the lid of steamer, and leave it for further 15 minutes for letting the dough raising again, before turning on the fire. 4) Then turn on the full fire. AFTER the water BOILING, for further 7 or 8 minutes, it is done. Turn off the fire, take them out. DON’T leave them inside the steamer after it is done. Have them with rice, millet or mung bean congee, or different soups along with other dishes, if you like. We also like to have it with steamed eggs for breakfast. 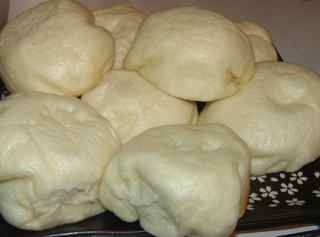 Mantou can be kept in room temperature if the weather is not too hot, but don’t leave them for too long though. Or leave them the fridge, or freeze them after cooling down. When eating them, they can be eaten as room temperature, or for the best result, is to re-steam them. If you cannot be bothered to use the steamer again, you can also leave them in the microwave, but ONLY 1 minute, if not warm enough, try 20 seconds more per time — if it is too long, it will be very very hard. 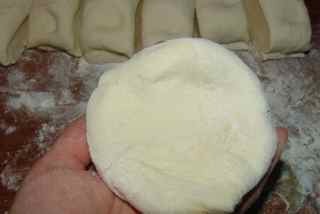 And microwave warmed mantou needs to be eaten quickly, otherwise it will get hard once it gets cold. That’s all — too much already, sorry, have good Sunday!! It says that the weather will be good! To make the raising flour I use 4 cups of flour, 1 and ¼ cup of water, around 5g fast yeast. After raising the flour, dust the board with dry flour, and place the dough on it. Knead well. Shape the mantou into half ball shape. Dip the mantou in oil. Cover the lid of steamer, and leave it for further 15 minutes for letting the dough raising again, before turning on the fire. Turn on the full fire and wait 7 minutes after the water boils.